As of June 15, 2018, Mass Audubon has protected a spectacular piece of land in Plainfield, MA. This ecologically rich 110-acre property is adjacent to our West Mountain Wildlife Sanctuary, and is part of a large network of significant wildlife corridors extending north all the way to maritime Quebec—as highlighted in the Berkshire Wildlife Linkages initiative that we are active participants in. Thanks to a grant from the Massachusetts Executive Office of Energy and Environmental Affairs, Conservation Partnership program, foundation grants, and the generous donations of individuals, we were able to acquire this land 6 months earlier than anticipated. The sellers, cousins who inherited the property, were pleased to see the land protected and under the care of Mass Audubon. On the wildlife front, one of the most exciting aspects of this property is the recent tracking of a moose directly through the property! We suspect the use of this property by numerous large mammals is common, and cannot overstate the importance of maintaining this wildlife corridor. Wildlife corridors will play a particularly important role in the age of climate change, where many species of plants and animals will need to shift location to find a more comfortable setting. West Mountain Wildlife Sanctuary is such a land bridge, linking the Kenneth Dubuque State Forest to the north with the Deer Hill State Reservation to the south—creating more than 10,000 acres of connected conserved land. 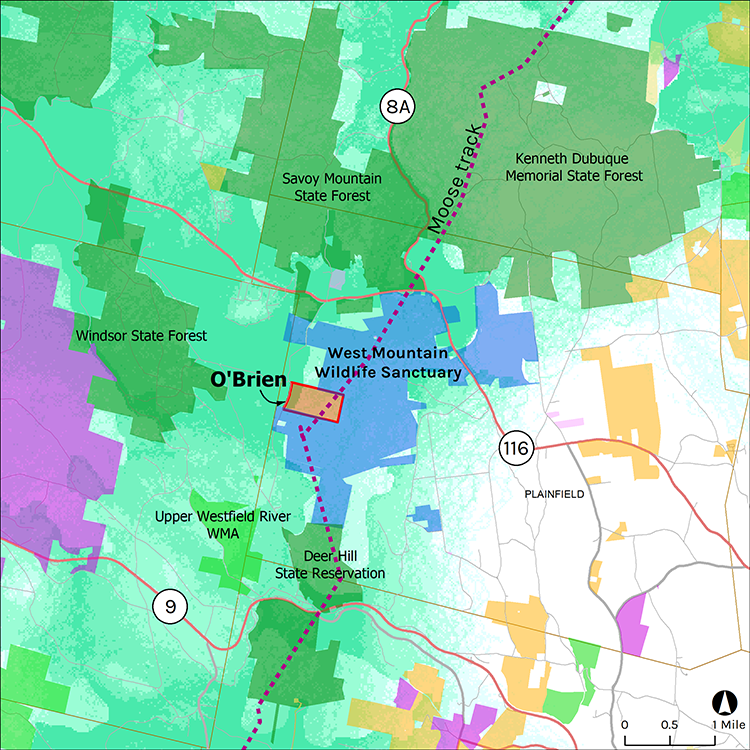 The map (click image for larger version) demonstrates these connected wildlife corridors as “conductance,” and West Mountain is on the eastern side of an area of very high conductance. This critical addition to the West Mountain Wildlife Sanctuary will help ensure that this wildlife corridor remains intact for the important role it will play in sustaining nature.